The Zimbabwean Music Festival has grown and changed over the past ten years. We want to share a brief glimpse of the history of this festival with you as we come together to celebrate our tenth festival! “Northwest MarimbaFest: A Celebration of Zimbabwean Music” was first organized in 1991 by a committee that included several people still actively involved as leaders in our music community. Mary Berg, Larry Israel, Claire Jones, David Long, Jan Maraire, and Sheree Seretse sent out a request in September of that year inviting marimba and mbira groups from near and far, to celebrate the first annual Shona music day! On November 9th, 1991 the community came together at a one day event with workshops and an evening concert. Their evening concert even included two bands that we are pleased to welcome at this year’s festival: Boka and Kudana! Even at that first festival, nine groups performed and attendees chose among three simultaneous workshop offerings. In late February of 1992 planning began for a 2nd “Northwest Marimbafest: A Celebration of Zimbabwean Music.” From Friday evening through Sunday afternoon, October 23–25th, 1992 celebrants came together to dance and learn new music and play for and with each other. By this time a MarimbaFest Statement of Purpose had been drafted, agreeing among other points, for the festival to be a not-for-profit event created by volunteers. Fundamental ideas in that vision include bringing the Shona music community together, fostering the continued growth of the community, and providing instruction in marimba, mbira, dance, vocals and hosho. The statement of purpose also documents the idea of staging an annual concert/dance with performances by all established marimba and/or mbira groups who wish to participate. Over 100 participants from around the US participated in the 1992 MarimbaFest. Moving along the timeline of our brief glimpse of history, the 1994 festival was held at Portland State University. 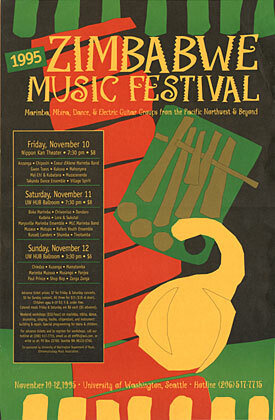 The poster advertised: “Fourth Annual…First Time in Portland Zimbabwe Music Festival — Three Nights of Hot African Dance Music — November 4, 5, 6, 1994.” The festival’s name was changed to more accurately reflect the diversity of music available at the festivals. Registration began on Friday evening, and three concerts satiated our appetites: Friday evening, Saturday evening, and our first afternoon concert on Sunday. Mai Chi Maraire cooked Zimbabwean meals for us and even opened her home to our whole community for an mbira party Saturday night! In 1995 the Zimbabwe Music Festival returned to its birthplace: Seattle, Washington. 1995 brought the first prefest workshops — spread over the course of the week before the festival, which was held at the University of Washington, on November 10th, 11th and 12th, 1995. We were lucky to eat Mai Chi’s great and inexpensive meals at one last festival, and we danced and sang and played music for three great days. The concerts crept into Sunday evening for the first time ever. Highlights of Zimfest ’95 included several great community events, including an mbira players forum, and a “Giving Back to Zimbabwe” forum. We enjoyed lots of great workshops: Stephen Golovnin even fixed marimbas and mbiras as the instrument doctor-on-duty. In 1996, no festival ever quite happened. Then, Michelle Buck, who had been a vital part of the final month of organizing the 1995 festival came forward with a proposal to host the festival in Victoria, BC. The 6th Zimbabwean Music Festival was held on May 16th, 17th and 18th 1997 — in Canada for the first time. Dumisani Maraire brought a musical seed from Zimbabwe and planted it in the Pacific Northwest in the late 1960’s, where it germinated and grew to unforseeable proportions. In 1997 Dumi was able to once again taste the fruit of his musical seed, when he came to Zimfest as a special guest. This was the first year that musicians traveled from Zimbabwe to the festival. They joined our North American community, teaching us and performing for and with us in Victoria, Canada — from 8:30 am Friday until midnight Sunday night — three days and nights of excitement! This was our first year having a full-blown outdoor market too. The brave, hardworking (crazy?) organizing group in Victoria agreed to create the 7th Zimbabwean Music Festival too! On May 29th, 30th and 31st 1998 we came together for a 2nd year in a row at the University of Victoria. Attendees chose from over 75 workshops, and shared dinners and village meetings, and lots of warmth and joy and love of this music during three amazing evening concerts — there were 28 groups on the list of performers! Then, in 1999 we journeyed to Port Townsend, Washington, for a very fine festival created by a very small organizing committee. Zimfest99 brought together an international community of over 400 people to teach, attend workshops and perform. We had the opportunity to learn from many different Zimbabwean and North American teachers and to share a wonderful weekend of musicmaking, dance and cultural exchange. Zimfest 2000 unfolded in Eugene, Oregon after two years of planning by a group of over 15 volunteers. We were treated to a preview of the upcoming musical extravaganza at an unprecedented prefestival concert on Thursday night that included the legendary Thomas Mapfumo and the Blacks Unlimited. This came as a grand finale to an evening of short sets by Zimfest 2000 performers. We enjoyed three days of workshops, afternoon and evening concerts, a special Zimbabwean dinner, cultural discussions and community forums, an extensive marketplace and a reunion with our friends — now spread internationally. Our music family continues to grow. It’s a tough act to follow, and at the same time the footsteps of our predecessors guide us as we fashion a vessel to hold all of us as a community. We honor those who are here with us for the weekend, our friends who are unable to attend the festival this year, and the energies of our North American and Zimbabwean ancestors. We feel very fortunate to have the opportunity to share our larger Zimbabwean music community with our local friends. Feel welcome! Play and dance and sing and laugh …and as they say…on with the show. We hope you have fun!